I’ve come to visit you, but maybe you don’t know it. I’ve come to your front door, I call out and wait. I’m waiting and waiting, but there’s no sign of you. No sign of your knowing I’m here. I sit, and stare at your door. We once had a connection, although it was hardly anything grand. But I always thought, we could build on what was small, and work it from there. There’s smoke coming from your chimney but I’m not seeing any lights. Not hearing any sounds. Yet, somehow I know you’re here. People walk by, and drive by, and they look at me. Maybe they think I’m a fool to do this. Maybe they think I’m stupid to sit unattended in the cold. When there are so many other places to be. Let me start with this. Being warm, and without, is overrated. Whether or not they accept what I’m doing, I don’t care. This is me, waiting to spend time with you, and for all I know, they too are on a mission, to be with someone all their own. Or maybe they’re doing really nothing important at all, just driving around and throwing glances at others. No one cares about unfinished business until matters rise. That’s my issue. I’m managing by being here with you, and speaking to you, from the outside in. You and I have unfinished business. Silent, darkened rooms don’t change that a bit. You’re not chasing me away, or telling me to go. You’re not telling me to not bother. And even if you did, I would bother, and I wouldn’t go, because you and I have more to do. And right now! It’s snowy and the wind hits hard. It’s starting to sink in, maybe we’re not going to meet up here. Maybe we’re not going to walk together, from this house. Maybe our meeting is going to have to be at a different house. And at a later time. Until it occurs to me otherwise, I’m here now. Speaking to you, calling through the closed door. Saying what you need to hear, now. Ara, I loved this story. I got a whole different feeling from the story than what the picture showed. As I sit and think about the picture, I re-read your story. It was wonderful. Hello Anonymous, thank you. I’m glad you enjoyed it. Sometimes when someone is unable to respond to us, we still show up and try. Hospitals are filled with bedside visitors who talk to their loved ones, who can’t say a word or move voluntarily– yet by us talking to our friend, we are bringing something that was once familiar or comforting in better days. We don’t get a response but we talk anyway. The chance that our loved one can hear us is important. 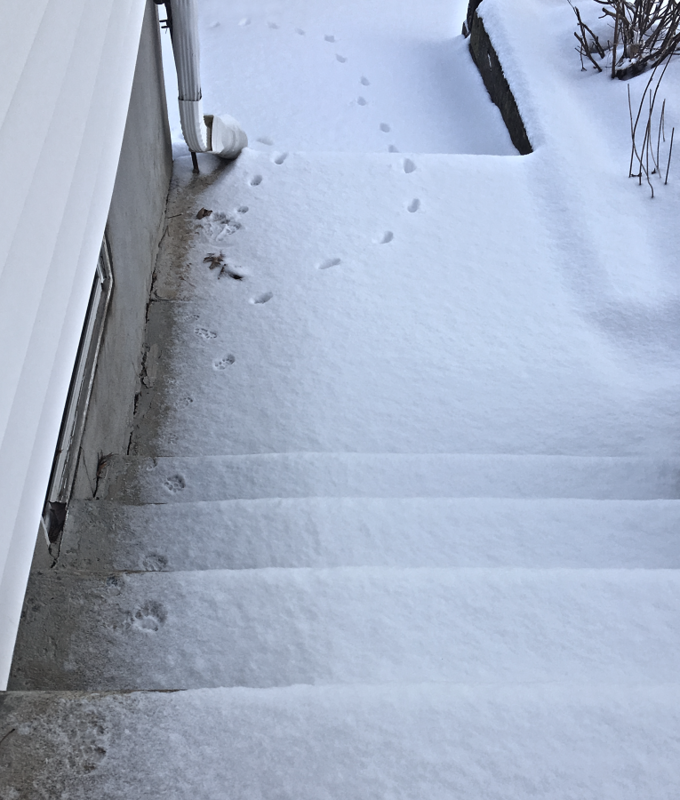 The cat prints outside the house represent the sacrifice a visitor makes, and the loneliness too. There’s a lot to assign in the story and picture, but as always, the most interesting is what the reader fills in for herself.